The purpose of this blog is to examine IFRS 13 as it relates to the Credit Value Adjustment (CVA) of a financial instrument. In the post GFC environment, greater focus has been given to the impact of counterparty credit risk. IFRS 13 requires the valuation of counterparty credit risk to be quantified and separated from the risk-free valuation of the financial instrument. There are two broad methodologies that can be considered for calculating CVA: simple and complex. For a number of pragmatic reasons, when considering the appropriate methodology for corporates, the preference is for a simple methodology to be used, the rationale for which is set out below. – the disclosures required about fair value measurements. Importantly, from a CVA perspective, IFRS 13 requires the fair value of a liability/asset to take into account the effect of credit risk, including an entity’s own credit risk. The notion of counterparty credit risk is defined by the risk that a party to a financial contract will fail to fulfil their side of the contractual agreement. There are two generally accepted methodologies when considering the calculation of CVA with each having advantages and disadvantages. The simple methodology is a current exposure model whereby the Net Present Value (NPV) of the future cashflows of the financial instrument on a risk-free basis is compared to the NPV following the inclusion of a credit spread. The difference between the two NPVs is CVA. The zero curve for discounting purposes is simply shifted by an appropriate credit spread such as that implied by observable credit default swaps. To give a sense of materiality, a NZD10 million swap at a pay fixed rate of 4.00% with five years to maturity has a positive mark-to-market of +NZD250,215 based on the risk-free zero curve (swaps). Using a 200 basis point spread to represent the credit quality of the bank/counterparty the mark-to-market reduces to +NZD232,377. The difference of -NZD17,838 is the CVA adjustment. The difference expressed in annual basis point terms is approximately 3.5 bp i.e. relatively immaterial. 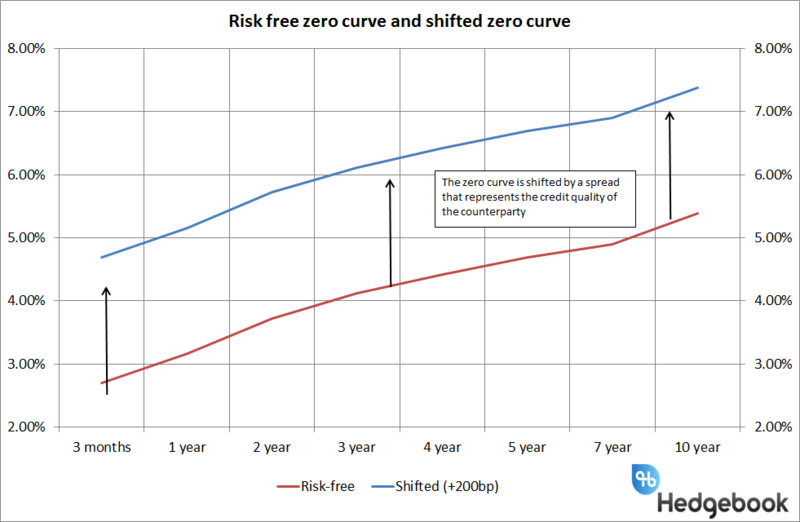 In the example we have used an arbitrary +200 bp as the credit spread used to shift the zero curve. In reality the observable credit default swap market for the counterparty at valuation date would be used. The advantages of the simple methodology is it is easy to calculate and easy to explain/demonstrate. The disadvantage of the simple methodology is takes no account of volatility or that a position can move between being an asset and a liability as determined by the outlook for interest rates/foreign exchange. The complex methodology is a potential future exposure model and takes account of factors such as volatility (i.e. what the instrument may be worth in the future through Monte Carlo simulation), likelihood of counterparty defaulting (default probability) and how much may be recovered in the event of default (recovery rate). The models used under a complex methodology are by their nature harder to explain, harder to understand and less transparent (black box). Arguably the complex methodology is unnecessary for “less sophisticated” market participants such as corporate borrowers using vanilla products, but more appropriate for market participants such as banks. An important consideration of the appropriate methodology is the nature of the reporting entity. For example, a small to medium sized corporate with a portfolio of vanilla interest rate swaps or Forward Exchange Contracts (FECs) should not require the same level of sophistication in calculating CVA as a large organisation that is funding in overseas markets and entering complex derivatives such as cross currency swaps. Cross currency swaps are a credit intensive instrument and as such the CVA component can be material. Fair value measurement requires an entity to explain the appropriate valuation techniques used to measure fair value. The valuation techniques used should maximise the use of relevant observable inputs and minimise unobservable inputs. Those inputs should be consistent with the inputs a market participant would use when pricing the asset or liability. In other words, the reporting entity needs to be able to explain the models and inputs/assumptions used to calculate the fair value of a financial instrument including the CVA component. Explaining the valuations of derivatives including the CVA component is not a straightforward process, however, it is relatively easier under the simple methodology. IFRS 13 requires financial instruments to be fair valued and provides much greater guidance on definitions, frameworks and disclosures. There is a requirement to calculate the credit component of a financial instrument and two generally accepted methodologies are available. For market participants such as banks, or sophisticated borrowers funding offshore and using cross currency swaps, there is a strong argument for applying the complex methodology. However, for the less sophisticated user of financial instruments such as borrowers using vanilla interest rate swaps or FECs then an easily explainable methodology that simply discounts future cashflows using a zero curve that is shifted by an appropriate margin that represents the counterparty’s credit should suffice. Credit Value Adjustment or CVA has been around for a long time, however, with the introduction of the accounting standard IFRS13, this year there is a requirement to understand it a bit better. The new standard requires the CVA component to be separately reported from the fair value of a financial instrument. CVA is the difference between the risk-free portfolio value and the true portfolio value that takes into account the possibility of a counterparty’s default. In other words, CVA is the market value of counterparty credit risk. The big question is whether it will be material enough for most organizations to worry about; given the potential complexity around its calculation, most would hope not. There is no doubt if you have cross-currency swaps the impact of CVA is likely to be material. However most companies that use these instruments would normally have a sophisticated treasury management system that would do this calculation at the push of a button. Most other organizations however will probably be relying on spreadsheets to capture and record their treasury transactions and will lack the ability to calculate financial instrument valuations let alone the more complex CVA. Will you need to worry about CVA is the question? Most do not know there is a requirement, let alone how it will be calculated and this is true of the audit profession as much as the corporate world. Whether it is material or not may be the question, however, it is likely that even if it is not material there may be a requirement to prove this. At the end of the day the audit profession will decide whether organizations will need to calculate CVA or not. In the meantime we are keeping a watching brief on both the banks’ ability to provide the CVA component and the audit firms as to whether they will force organizations to calculate it. Why Timing is Key for Hedging! Just like everything else in life – from barbequing, to merging into traffic, to releasing new products during certain economic cycles – timing is absolutely crucial in hedging foreign exchange exposure. The best way to know when to hedge or not is by looking at a chart – yes, it’s that simple! In April 2005, the NZDUSD moved to new all-time highs, having broken the previous one set over a year earlier. At this time, it wouldn’t have been wise to hedge against further new highs; but taking on a hedge for a downside risk would have been reasonable. 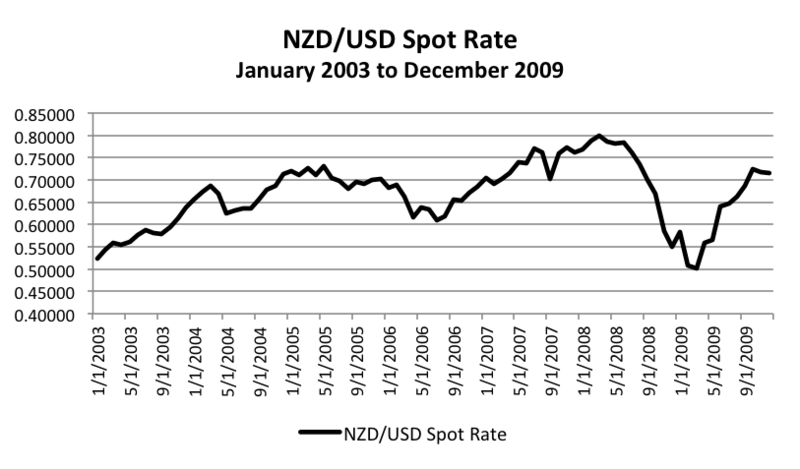 The same can be said about the NZDUSD in January 2009 – it had moved to its lowest exchange rate in over six-years – it might not have been appropriate to hedge against further downside risks, but instead more proper to hedge against upside risks (hindsight being 20/20, this would have been a wise idea). For example, in January 2008, it would have been a good time for a New Zealand company hedge payments made in U.S. Dollars, because were the NZDUSD to depreciate in value, the more money the firm would have to pay. If in January 2008, the New Zealand company decided not to hedge US$10 million in payments due a year later, it would have seen its cost rise from N$12.5 million (NZDUSD = 0.8000) to N$20 million (NZDUSD = 0.5000). By not hedging, the New Zealand firm would have had to pay out an extra N$7.5 million! The next blog post will illustrate how market positioning can be used in timing. Exposure to the interest rate markets can be hedged with many financial instruments. One of the more flexible is the risk reversal. A key benefit of the risk reversal is that it does not exposure the hedger to immediate gains or losses (similar to a swap or futures contract) as it allows the hedger to create a range in which their exposure is un-hedged. A futures contract is an obligation between two parties to purchase or sell a physical or financial product as some date in the future. Interest rate futures are traded on exchanges such as the Chicago Mercantile Exchange and provide a clearing platform for traders that eliminate credit risk. The strategy of a risk reversal for a hedger that is looking to mitigate downside exposure to the interest rate market is to purchase a put on an interest rate futures contract and simultaneously sell a call on an interest rate futures contract. The strike price of the call and the put are generally a certain percentage away from the current spot price, creating a range above and below the current price where the trader is not hedged. If the price of the futures contract falls below the put, the trader receives a payout. If the price of the futures contract rises above the call, the trader needs to make a payment. A currency swap locks in a price of a currency pair and is another tool that can be used to manage an organisation’s cash flow. The currency swap pays the fixed-price buyer of a currency pair a payout equal to the difference between the current price and the settlement price of the swap. Fixed Price is a negotiated price which will be compared to the floating (index) price to determine if the swap is in our out of the money. Floating Price is created from the reference index by averaging the reference prices over the period of the agreed swap. Floating Payment is calculated by multiplying the floating price by the volume of the notional used for the currency pair. Swap Calculation: The average floating price over the swap period is compared to the fixed price, to determine which way cash will flow. Swap Pricing Periods: The periods of time that are agreed upon which incorporate the swap. 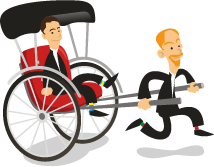 When the swap period is complete the floating price is examined, and payments are exchanged. Generally monthly periods are used to compute swaps.